The term “large envelopes” (also known as flat mail) refers to First-Class Mail sent in envelopes that exceed either 6&frac18;″ in height, 11½″ in width, or ¼″ in thickness. Large envelopes are often comprised of items such as marketing newsletters, product catalogues and legal correspondence. They can also contain CDs, books, manuscripts, magazines, reports or sets of documents that you don’t want to fold, although the mail piece must be uniform in thickness. Typically, large envelopes are sent in an envelope large enough to fit an unfolded 8½″ x 11″ sheet of paper. Envelopes used for flat mail cannot be more than ¾″ thick, 12″ high, 15″ long or weigh more than 13 ounces. The USPS considers any envelope bigger than this size to be a package, and will be subject to parcel prices. Pricing depends on the weight of the envelope with prices starting at $1.00 increasing by $0.15 for each additional ounce. To send large envelopes, you do not need to visit the Post Office as long as you have postage stamps, access to a postage meter or can print postage online from a company like Stamps.com. Simply address your envelope, affix the correct amount of postage to the upper right corner and drop it in a collection box or hand it to your mail carrier. 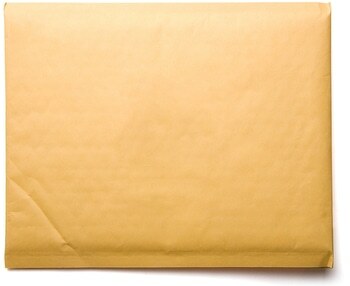 Large envelopes sent within the United States generally arrive within 3 business days. When you combine the ease of sending large envelopes with the convenience of Stamps.com, you and your staff will never have to waste time at the Post Office again! 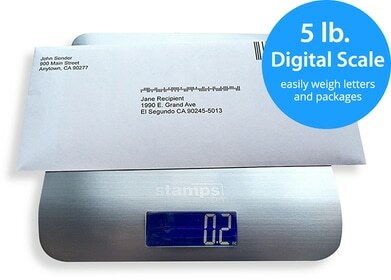 Not only does Stamps.com tell you exactly how much postage is required to send your mail to any domestic or international destination, it also lets you print official, USPS-approved postage and address labels from the comfort of your own home or office. When you send large envelopes to an international destination, Stamps.com allows you to fill out customs forms directly through the Stamps.com interface so that you can print postage, address labels and customs forms in one easy step.